Hydra Steel can also be taken to help you lose unwanted water weight and bloat before a photo shoot or special occasions such as a wedding or vacation! An advanced all natural diuretic formula designed to help you achieve a ripped, hard look and gain a competitive edge on the competition in as little as 10 days. Safely helps flush out excess water while replenishing essential electrolytes to help maintain muscle performance and fullness. Uva Ursi: A plant commonly called Bearberry, it contains arbutin, a natural compound with strong diuretic properties that also promotes a rapid expulsion of body fluid through the urinary tract, relieving temporary water retention without putting stress on the kidneys. Vitamin B-6: Essential in balancing sodium and potassium levels in the body while also responsible for the production of monamine neurotransmitters. Vitamin B-6 increases metabolic rate while metabolizing glycogen, metabolizes protein and creates nonessential amino acids. Magnesium: An essential mineral necessary for energy production and transport, as well as supporting protein synthesis, bone growth, flexibility, and the maintenance of the pH of various organ systems. Juniper Berry: Naturally stimulates the kidneys to move fluids faster. Potassium: As an electrolyte, it aids in the maintenance of enzyme structures and fluid balance. 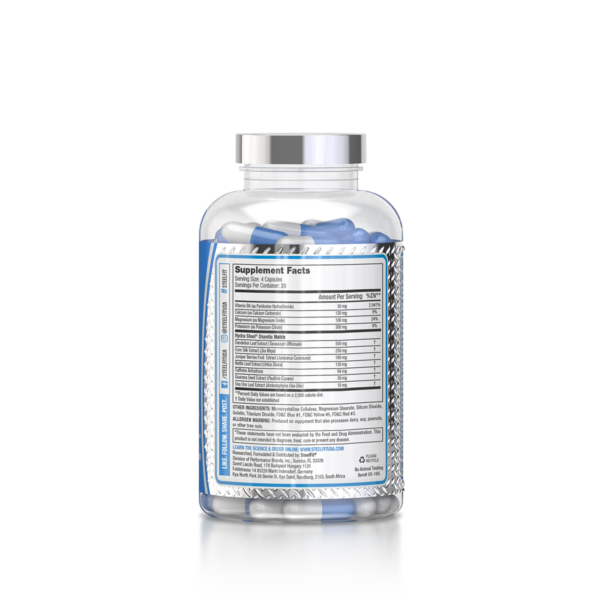 Dandelion Extract: An extremely effective diuretic that does not cause the side effects of mineral depletion. It contains powerful diuretic compounds called taraxasterols that support the secretion of excess water as well as bitter compounds that enhance the efficiency of the body’s eliminative and detoxifying functions. 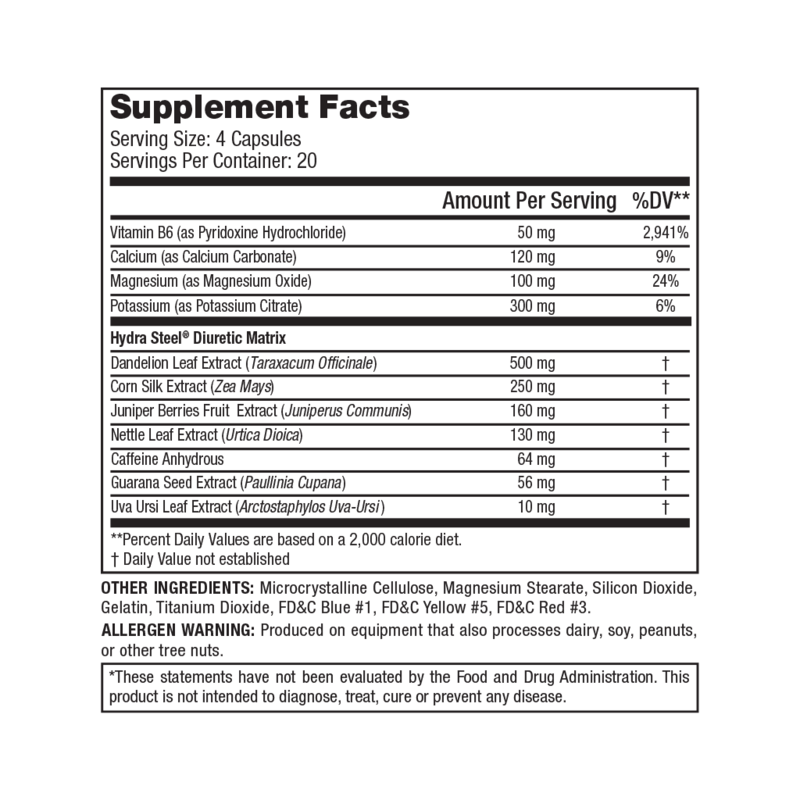 As a dietary supplement, adults take four (4) capsules with at least 16 fl. oz. of water twice daily (once in the morning and once in the afternoon) preferably with a meal or as recommended by a physician. Drink at least 6-8 glasses of water daily. Do not exceed recommended dose. 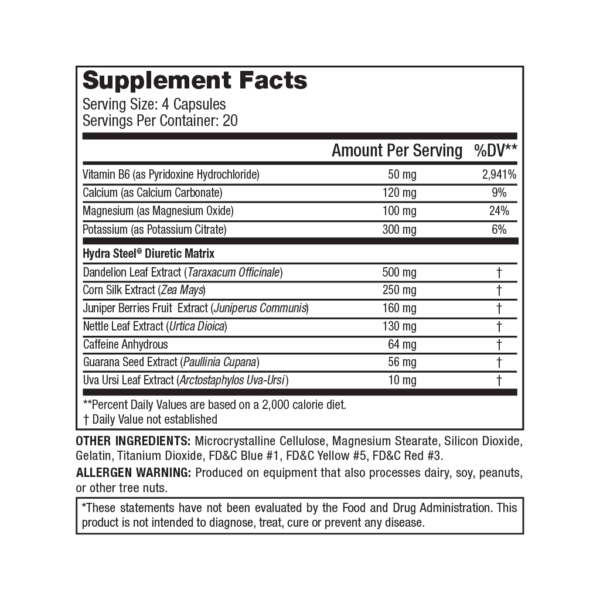 Note: Competitors should start taking Hydra Steel 10 days prior to their fitness competition to achieve maximum results. 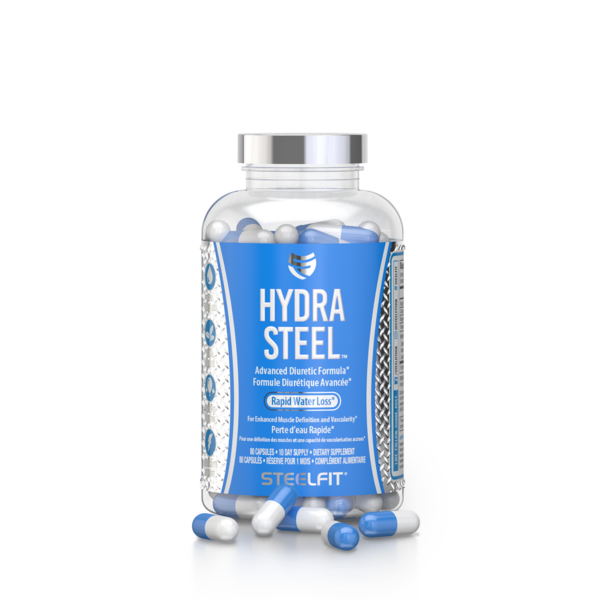 Hydra Steel is designed for temporary water weight loss.